In the race to save one of their own, Sigma Force must wrestle with the deepest spiritual mysteries of mankind in this mind-expanding adventure from the #1 New York Times bestselling author, told with his trademark blend of cutting edge science, historical mystery, and pulse-pounding action.Arriving home on Christmas Eve, Commander Gray Pierce discovers his house ransacked, his pregnant lover missing, and his best friend’s wife, Kat, unconscious on the kitchen floor. With no shred of evidence to follow, his one hope to find the woman he loves and his unborn child is Kat, the only witness to what happened. But the injured woman is in a semi-comatose state and cannot speak—until a brilliant neurologist offers a radical approach to “unlock” her mind long enough to ask a few questions.What Pierce learns from Kat sets Sigma Force on a frantic quest for answers that are connected to mysteries reaching back to the Spanish Inquisition and to one of the most reviled and blood-soaked books in human history—a Medieval text known as the Malleus Maleficarum, the Hammer of Witches. What they uncover hidden deep in the past will reveal a frightening truth in the present and a future on the brink of annihilation, and force them to confront the ultimate question: What does it mean to have a soul? Veterinary Medicine is a very time consuming, stressful profession, especially for the owner of the veterinary practice. 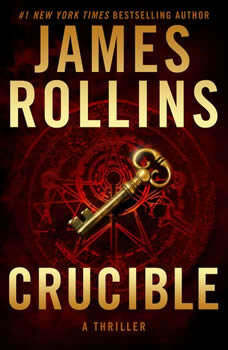 Author, James Rollins (aka James Paul Czajkowski) began his adult career with a DVM degree from the University of Missouri in 1985. He was then working as many as 18 hours a day, while writing on his lunch time, or any spare minutes he might find. For ten years he operated his practice, employing as many as 24 staff personnel, continuing to write during spare moments. One day, he decided to reverse the job and hobby routine. He began writing full time and spent a day or so per week volunteering to do neuter surgeries at the local SPCA. Rollins began his storytelling very early as a child, so it came naturally to him by the time he made it his main career. His writing gives the reader a look into unseen worlds, mostly underground or underwater. His books are full of originality, scientific breakthroughs, as well as historical insight. All of this packed into a fast paced story line that is honed using his basic knowledge of science and medicine. That skill sets James Rollin's books apart from the others. He is a #1 New York Times bestselling author of international thrillers that are translated into over forty languages. His "Sigma" series is his most popular.